This tool enables the users to convert DXL messages to Outlook MSG file format. Users can easily export multiple Lotus Notes emails and calendars of DXL to Outlook MSG. Moreover, during the conversion of DXL files, attachments remain embedded within .msg files along with complete metadata. The DXL file to MSG exporter allows you to auto search and load DXL files from its folders. After loading, it generates preview of messages along with their attachments. However, attachments could be documents, images, etc. It shows the email and meta properties in original format. While saving Lotus Notes DXL as MSG format, the software provides multiple file naming options. Users can save email named after its subject, subject + date (DD-MM-YY) and other such combinations. Besides this, auto increment and MD5 are other naming conventions available to save the output as Outlook MSG files. While exporting DXL files to MSG for Outlook, the tool provides an option to choose DXL messages, which one wants to export into MSG format. It is not mandatory that all emails/folders are to be exported into .msg extension. Therefore, users can check their desired items and then, continue with further exporting. 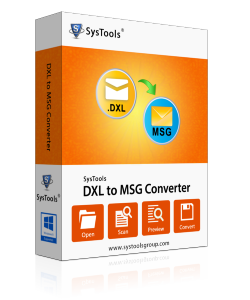 DXL to MSG converter tool is designed with advanced and high-tech algorithms. The way it is accomplishing its task ensures customers that the original folder structure will be maintained throughout the conversion procedure. It provides 3 options to for folder hierarchy like - Maintain Hierarchy, Flat Hierarchy, and Store At Source Location. The software enables its users to store resultant files at any desired location where they want. It is also possible to create a new folder directly from the software panel and select it as destination path. Moreover, one can change the default name of resultant files by using Naming Convention options of this tool. This is an XML database file of the Lotus Domino server, which stores entire information of IBM Notes database with designing components, forms, views, schemas, and documents. The file format provides an interchange and exporting format for the database. This file is considered as the language file, which enables a person to add details and structural attributes within the database via XML. An MSG file is a single email message storage data file of Outlook. It is created by dragging and dropping an email from Outlook to any other location like the desktop. MSG files are used when persons want to carry only a few emails of Outlook, instead of having entire data with them. However, the MSG files are opened only by Microsoft Outlook email client. Apart from this, users need to look for the freeware that provides facility to view MSG files on their machine. Due to one or the other reason, users require strategy to export all emails from DXL file to MSG format. Such end users can utilize this marvelous DXL to MSG conversion tool, which is having an exquisite process to perform DXL file to Outlook MSG migration. The best part of this tool is that neither Lotus notes with Domino Server nor Outlook are required as supportive programs of converter utility. This converter of FreeViewer lets users export thousands of DXL emails into MSG format all at once. Will I be able to export DXL emails to MSG with their respective attachments? Yes of course, you will be able to convert messages of DXL file with attachments in MSG file format. The number of attachments per email and extension all will be remain same throughout. Does your software supports transferring of corrupted DXL messages to MSG extension? No, the source DXL file should be healthy state to work with our DXL file to MSG converter. Is there any file size limitation of DXL to work with your utility? No not at all, DXL file of any size can be appended for conversion. Our DXL file to MSG exporter supports file of any size without any stuck. Will I be able to perform email file migration from DXL to MSG with help of your importer on Windows 10? Yes, our tool is totally a Windows-based solution, which is supported on all version of Windows, including 10. "I want to show my gratitude towards the entire FreeViewer team who had developed the best DXL to MSG converter tool. It was so easy for me to perform the conversion that I was not able to realize that when the migration got finished. Big thanks to the software developers!" "Talking about manual ways then, no such solution exists that enable Domino server users to export DXL file to MSG format. Therefore, the only approach left is to use third-party approach. I researched for the same and found this utility. Literally, it is a perfect software to import DXL emails to MSG"